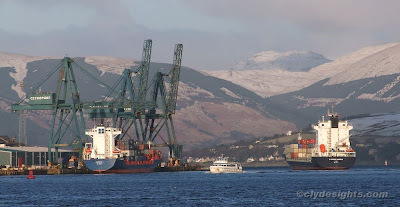 A similar view to one shown earlier this week, but this time showing two container ships and the small passenger catamaran ALI CAT, which was returning to Greenock following her morning duties on the Gourock-Dunoon ferry service operated by CalMac. Berthed alongside at Ocean Terminal is CANOPUS J, a regular caller on MacAndrews' services to the Iberian peninsula. The other ship, about to berth, is a new visitor to the Clyde making her first appearance on the river. X-PRESS ELBRUS is on charter to OOCL for their SIX service between Southampton, Dublin, Greenock and Belfast. X-PRESS ELBRUS was built in 2005 and previously carried the names TS NAGOYA, TS PUSAN and latterly GABRIELLA while on various charters.